Ah, Liza Minnelli: what other name exudes glamour, style and unforgettable music? The American house Profiles in History’s upcoming auction is full of memorabilia, costumes and photographs from one of the 20th century’s most memorable careers. Liza Minnelli in "Cabaret", 1971. Photo via amazon.com. Liza Minnelli’s star studded career has lasted over half a century. Minnelli has been a part of numerous productions and it is from these, as well as from hers and her parents lives, that Profiles in History will auction off nearly 1800 objects. Vicente Minelli's directing script for "An American in Paris". Photo: Profiles in History. With an abundance of objects, the sale will be held over three days. The first day focuses on Liza Minnelli’s early years, with items from her childhood and her parents' careers. Vincente Minnelli was a prestigious director, with movies like Meet Me in St. Louis (1944), An American in Paris (1951) and Gigi (1958) on his resume. 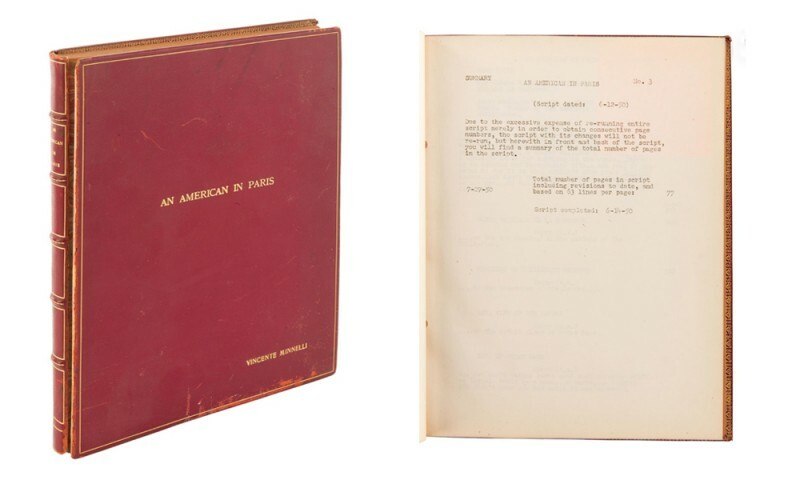 Lot 65 consists of Vincente Minnelli’s shooting script for An American in Paris. With it’s custom bound leather frame and gold gilt text "An American in Paris Vincente Minnelli" on its front, the script is an important piece of movie making history. 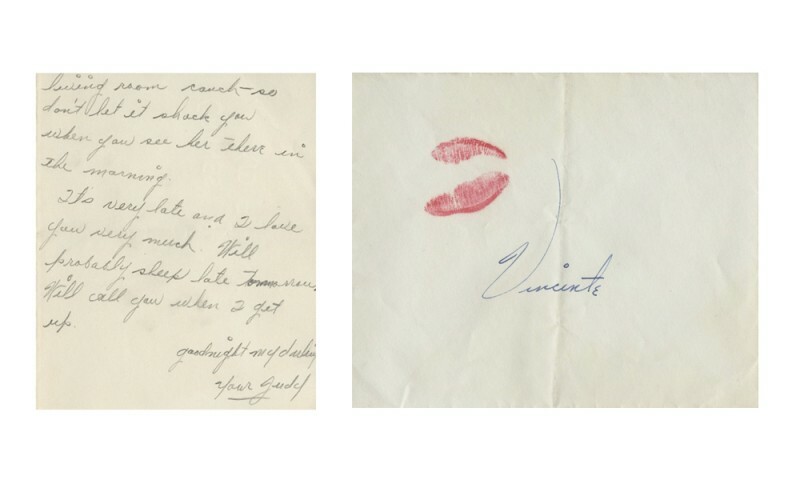 Sealed by a kiss – Judy Garland autograph to Vincente Minnelli. Photo: Profiles in History. Vincente Minnelli and Judy Garland were married between 1945-1951, and Liza their only child together. During Profiles in History’s first day, bidders will be able to get their hands on a Judy Garland autograph letter signed to Vincente Minnelli with an lipstick kissed envelope. The autograph carries a loving note from Judy to her husband, with the last line reading “Goodnight my darling. Your Judy”. This might be the auctions most romantic item. Judy Garland, Liza Minnelli and Mickey Rooney. Photo: Profiles in History. 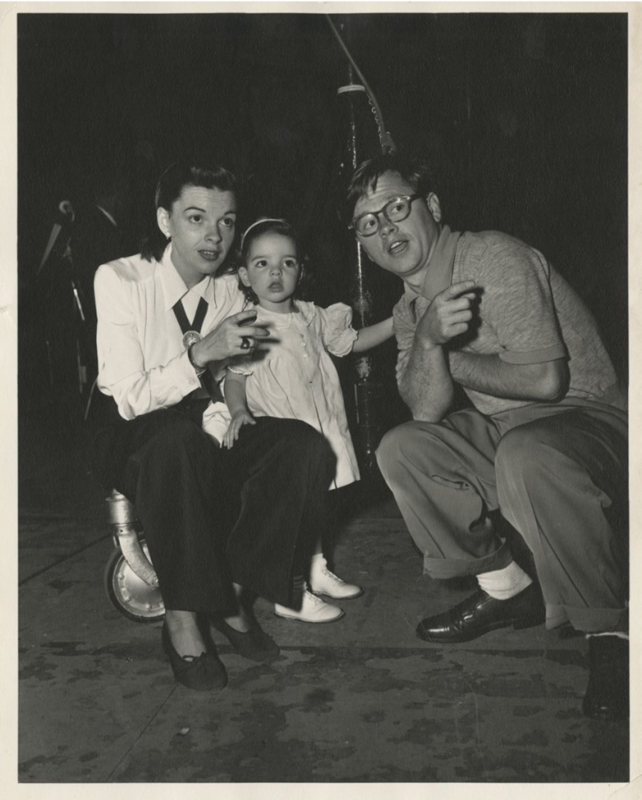 The sale also features many photographs from the 1940s and the 1950s, like these three photos, showing us a 4 year old Liza together with her mother and the American actor Mickey Rooney. Liza Minnelli's shooting script for "Cabaret". Photo: Profiles in History. The second day is all about Liza. During the 1970s Liza Minnelli was on the top of her game, and starred in one of the most striking musical films of all time, Cabaret (1972). Her career skyrocketed and suddenly, her name was everywhere. Who can call themself a Minnelli fan without loving the story about Sally Bowles? 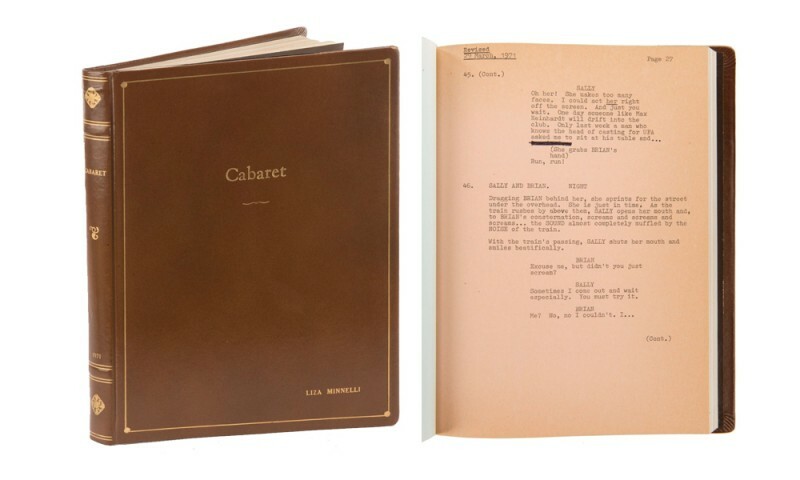 Lot 661 comprises of Liza Minnelli’s personal hand-annotated shooting script for Cabaret. It’s dated on 15 February 1971, and the front cover reads the movie’s title and the actress’ name in gold. If this isn’t a piece of movie history, we don’t know what is. Minnelli's 1971 Rolls-Royce Silver Shadow sedan. Photo: Profiles in History. In need of a car? 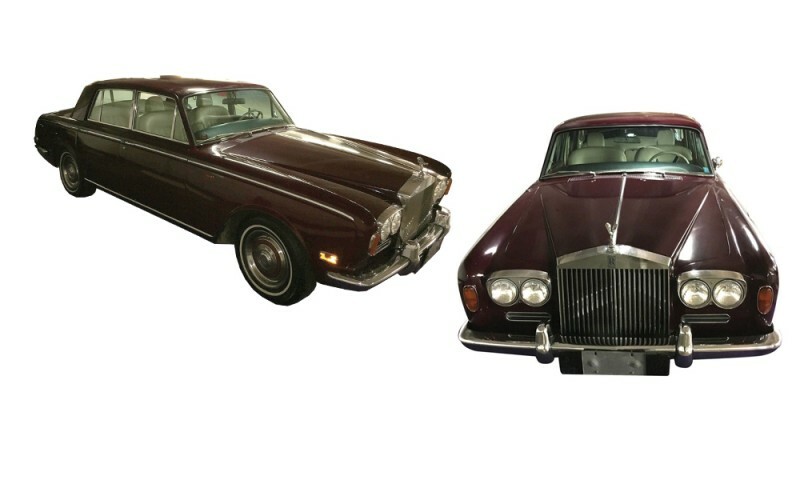 Well, why don’t you place a bid on Minnelli’s 1971 Rolls-Royce Silver Shadow sedan. Liza drove the car for decades after it was given to Minnelli by by casino mogul William F. Harrah. Liza Minnelli's Sally Bowles costume from "Cabaret". Photo: Profiles in History. Minnelli’s portrait of the American performer Sally Bowles has been loved and cherished for over 40 years, making Minnelli one of popular culture’s most prominent figures. On Profiles in History’s last day of sale, one of their absolute top lots will go under the hammer: Liza Minnelli’s Sally Bowles outfit, along with bowler hat and boots. The black bugle beaded open front jacket, the satin halter top vest with velcro front closure, the pair of elastic waist black satin pink gem-studded hot pants as well as the hat and the boots is estimated to between $4,000 - $6,000. Minnelli's "Ruby Slippers." Photo: Profiles in History. But what about Minnelli’s love life, since bidders gets a glance on Judy Garland’s and Vincente Minnelli’s? In 1974 Liza married director Jack Haley Jr. Though their marriage didn’t last, the shoes Minnelli wore at the ceremony are now available. 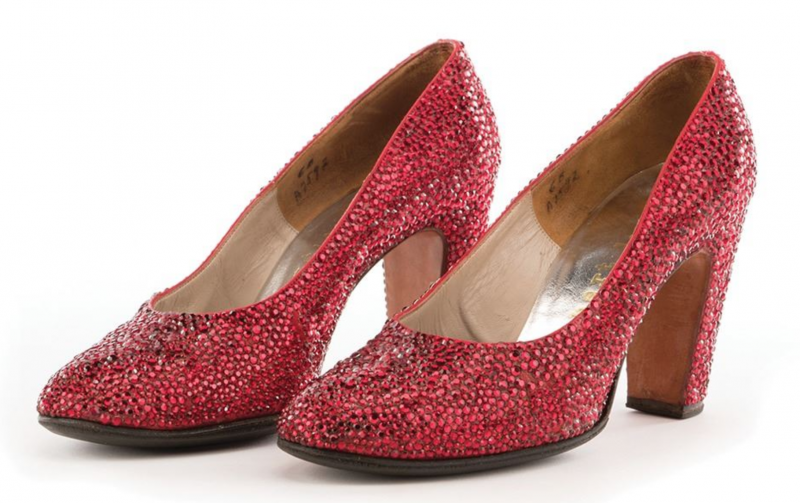 These “Ruby Slippers” are vintage originals Herbert Levine high-heeled court shoes, encrusted with faceted faux rubies, and the golden insoles are imprinted with the message "Especially for Liza". The legacy of one of Hollywood’s most fetching icons will be up for sale at Profiles in History’s Love, Liza: The Auction, Monday, July 30 - Wednesday, August 1. As usual, Profiles in History’s entire catalog can be found at Barnebys.